Got iTunes 4.9? Here are some handy links to good articles, tips, and other resources. Apple support articles about podcasts and iTunes 4.9�about podcasts, Frequently asked questions, browsing and downloading podcasts, listening to and managing podcasts, "I can't subscribe to a podcast"
iTunes and podcasting�some interesting reader comments from the always-interesting Macintouch.com. Create your own podcast in GarageBand�a simple recipe for cooking up your own. Steve Jobs on iTunes 4.9�a transcript of an interview with ABCnews.com. Apple has released iTunes 4.9, a minor update that will be major for minor broadcasters. iTunes 4.9 adds support for podcasts, those roll-your-own radio shows that are being embraced by everyone from Wayne and Garth to Clear Channel Communications. I went through Apple's Web site to download the new version, and after five minutes, the download had yet to begin. It's a safe bet there's a serious digital traffic jam at Apple's servers. Ah, but the road is broad and clear if you take a different route: Mac OS X's Software Update system preference. My copy of iTunes 4.9 is dribbling in even as I type. One more tip: In the interest of hanging on to the past, I renamed my iTunes application icon to "iTunes 4.8." That way, it won't be deleted and replaced by the new version. One never knows: there could be good reasons to hold on to the older version. My friend and radio colleague Bob Laughton turned me on to yet another wacky application for the I-might-just-love-it-too-much Flickr photo sharing service. 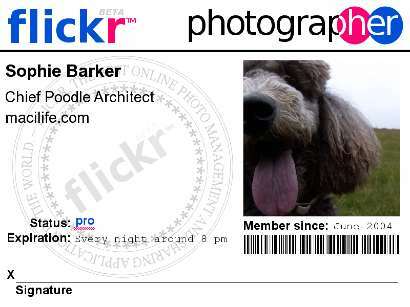 The Flickr Badge Maker lets you create an official-looking identification badge bearing a photo from Flickr and other text. Enter the URL of any public photo on Flickr, type a few lines of information, and a minute later, you have a badge, complete with a meaningless barcode (if that isn't redundant). One of these badges could be just the thing for the next Flickr meetup in your area. It could also be a swell way to become the star of an extraordinary rendition, so be careful how you use your badge. If someone from Homeland Security tries to throw a black cloth bag over your head, just say, "Dude! I was just having fun with Flickr while listening to a podcast!" And send me a postcard from Syria. Happy Monday, if that isn't a contradiction in terms. Another virtual user group appearance. On Saturday, I awoke at 6 am. One hour later, I was in front of a user group a couple of thousand miles away. Yes, it was another iChat AV-based user group appearance, this one with the Northeast Ohio Apple Corps. We had a great time: I gave attendees a tour of my studio, carrying my iSight around and pointing out things of interest: my soundproof computer cabinet, dual Cinema HD displays, and other toys, not to mention Sophie the standard poodle. For the next hour or so, I answered questions on topics ranging from the Apple/Intel deal to digital cameras to iPhoto and more. I do declare, these virtual MUG appearances are, in some ways, even more fun than appearing in meatspace. There's the added geek factor of using videoconferencing, and the ability to give folks a tour of the studio where I spend 27 hours a day. And iChat AV just works so darn well that it fades into the background. As far as I'm concerned, I am standing in front of a large group of people. User groups: contact me about scheduling one of these. This Associated Press story is just in (and I learned it through the always-updated headlines on my iTunes resource page): "Internet file-sharing services will be held responsible if they intend for their customers to use software primarily to swap songs and movies illegally, the Supreme Court ruled Monday, rejecting warnings that the lawsuits will stunt growth of cool tech gadgets such as the next iPod. The unanimous decision sends the case back to lower court, which had ruled in favor of file-sharing services Grokster Ltd. and StreamCast Networks Inc. on the grounds that the companies couldn't be sued. The justices said there was enough evidence of unlawful intent for the case to go to trial." Toby Malina, my coauthor on Sell It on eBay, has done a stellar job of covering eBay Live, the massive convention of eBay users that took place last week in San Jose, California. Check out our book's companion blog and get the scoop on the latest eBay selling developments. More Nine Inch Nails Remixing "Fun"
Attention, Nine Inch Nails fans! (And I'm not one of them.) The band has posted another of their songs in multitrack format for us to pick apart, remix, and perhaps make listenable. The song Only is available for not only GarageBand, but also Ableton Live and a couple of Windows-based music products. Macworld remixed my book. Get Macworld? The July 2005 issue contains an excerpt from my book. The excerpt deals with creating disc images and ensuring more reliable burns in iDVD 5. Check it out, then buy the world's best-selling iLife book�345 full-color pages and a two-hour, 43-minute instructional DVD�for just $23.09 on Amazon.com. It's Friday! Or, as we work-at-home types call it, "the day before two days of fewer phone calls." It's dank and foggy in Mendocino today, one of those days where the ocean and the land tussle over where one ends and the other begins. Temperatures in inland areas will probably hit the mid to upper 90s, but we'll be lucky to see 55. Must be summer. So here to take you into your weekend is a collection of links, pointers, and trends. Trend watch: Kodak has announced that it will stop manufacturing black-and-white photographic paper. Time to buy that Epson R2400. A few weeks ago, Kodak angered all 17 members of the Super8 filmmaking community by announcing the impending death of Kodachrome film in the Super8 format. And the BBC reports that sales of the venerable audio cassette have plummeted. Bits, on the other hand, are alive and well. And easy to steal�er, download. Griffin Technology's iFill looks like a great tool for grabbing fully tagged MP3s from streaming Internet radio sites. Check out the write-up by my colleague Chris Breen, then download iFill before the RIAA gets wind of it. Last week I wrote about a tiny portable tripod that my friend Bob Laughton brought me from Europe. I lamented that the Bilora Digi Pod Micro didn't seem to be available here in the US. A reader kindly emailed to say he'd found the very similar tripod pictured here. 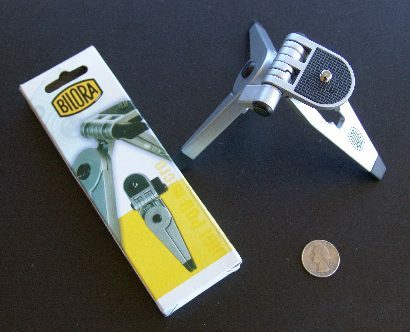 It does indeed look like my Bilora tripod, though it's bigger: the Bilora tripod stands just 3.5 inches high, while the Mini Travel Tripod is five inches high. Still, it's pretty tiny, as is the price�less than $5US. Toby Malina, with whom I coauthored Sell It on eBay, spent yesterday at the opening day of the eBay Live convention in San Jose. She's already written up some of her experiences on our book's companion blog, with more to come. We're working on a second edition of our eBay seller's guide now; look for it later this year. I'll be appearing (via iChat AV) at the Northeast Ohio Apple Corps user group meeting tomorrow at 9 am Eastern time. See the link at right for details. And with that, it's time to walk the dog through the fog. Have a good weekend, and remember: the world's best-selling iLife book�and the only one to include a companion instructional DVD�is only $23.09 on Amazon�34 percent off the cover price. Order The Macintosh iLife '05 today. Is This Guy Living at the Apple Store? Okay, so this is just weird. Yesterday, I uploaded a photo to Flickr that shows me speaking at the Apple Store in San Francisco on Tuesday. There's something funny in the photo: as I speak my profound wisdoms, you can clearly see a guy in the audience using a Windows laptop with earbuds planted in his ears. Being a good Flickr citizen, I added the tag "applestore" to the photo to assist folks who are looking for photos of Apple stores. Being a good procrastinator, I then took the next step: I went looking for photos that other Flickr members have taken of Apple Stores. 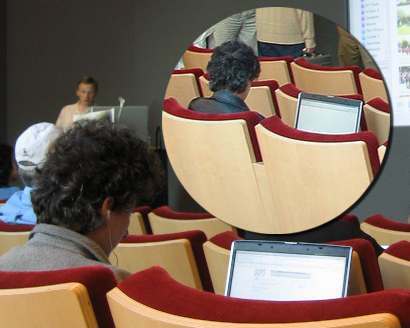 And look what I found: a photo, taken at the San Francisco Apple Store on June 17, five days before my appearance, that appears to show the same guy sitting in the theater using the same laptop. In the above photo, the circular inset is from the June 17 photo. We don't see the guy's face, but the hair is the same and the Windows laptop is the same. Check out both photos�you be the judge. Memo to Apple: you might consider charging rent to this dude. I had a great time speaking at the Apple Store in San Francisco on Tuesday night. I talked mostly about iPhoto 5, but we dipped into iMovie HD and GarageBand, too. On my drive back to Mendocino, I stopped at the northern end of the Golden Gate Bridge and snapped a quick panorama: five shots that I later stitched using Photoshop CS'2 PhotoMerge feature. What a gorgeous city. I'm a country boy, but I love spending time in San Francisco. Now that I have a sublime printer for printing black and white photos, I'm converting more color photos to black and white. 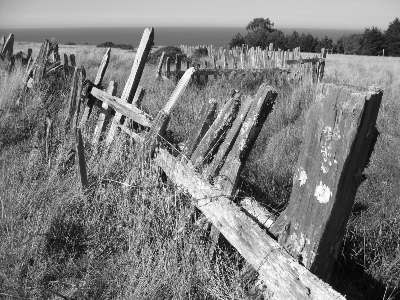 iPhoto's B&W button does a good job of the task, but there are techniques you can use that provide more control over the tonality of a black and white conversion. A black and white photo with a deep, rich contrast range and sharp details can be beautiful. (Just ask Ansel Adams.) iPhoto's B&W button does a good job of converting a color photo to black and white, but you can often improve on its efforts: after clicking B&W, adjust the Saturation, Temperature, and Tint sliders in the Adjust panel. You can also use the color-adjustment sliders to apply a color tint to a black and white photo. After converting the photo to black and white (and improving on it using the previous tip, if you like), save the photo. Then re-open it in edit view and drag the color sliders. In the following example, I dragged the Temperature slider to the left until its value read about -25. If you're a Photoshop user, there are additional techniques you can use to do black and white conversions. The best place to learn about them�indeed, the best place to learn everything that Photoshop CS2 provides for photographers�is in a new book: Martin Evening's Photoshop CS2 for Photographers. I bought this book last week, and I'm having trouble putting it down. Its depth and scope are amazing; every page exudes expertise. Martin is a fashion photographer in London and a renowned Photoshop guru and instructor (disclaimer: he appears in a couple of the Photoshop DVDs my company has produced). A review of the book on Amazon puts it beautifully: "Many Photoshop books seem to be written by people who are clearly skilled enough to earn their living with Photoshop, but are not photographers. Their books are filled with pictures taken on vacation. This is the real thing; top quality photographs; real world skills." Photoshop CS2 for Photographers: highly recommended. And while you're shopping... Pick up a copy of the world's best-selling book on iLife. With The Macintosh iLife '05, you get 345 full-color pages and a two-hour, 43-minute companion instructional DVD�for $23.09 on Amazon (34 percent off). San Francisco Apple Store Appearance Tonight! And eBay Live Later this Week! Bay Area residents: I'll be talking about iLife, my hot new printer, Photoshop CS2, and much more at the Apple Store in Union Square tonight. The fun begins at 6 pm. See you there! eBay Area residents: Toby Malina and I are working on a revised edition of our best-selling Sell It on eBay, a guide to successful online auctions. We've started a companion blog for the new edition, and Toby has been dutifully posting eBay tips and insights for the last month or two. She'll be at eBay Live later this week, blogging the event and gaining insights to incorporate in the new edition. The new edition of our book will be out later this year, and it'll be hot. In the meantime, check out the blog. See you in San Francisco tonight! "Photoshop CS2 is a tour de force, packed with innovations that will make your images better and get you home faster. Bridge is far superior to the File Browser; smart objects and all the productivity enhancements are great; the new Lens Correction and Vanishing Point features are dreamy; and video preview is glorious. This is the most significant Photoshop upgrade in quite a while, and if you�re serious about digital imaging, you need it." G'day! Let's kick off the week with a comparison of Epson's R1800 and R2400 printers and a reminder of my Apple Store appearance in San Francisco tomorrow. 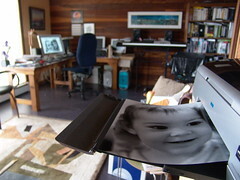 Over the weekend, I posted a photo on Flickr that shows part of my studio, with a 13 by 19-inch, black-and-white print emerging from my new Epson Photo Stylus R2400 printer. That photo prompted a question from a fellow Flickrer (or is it "Flickrr"? ): why choose the $849US R2400 over the less expensive R1800? It's a good question: both printers can handle 13 by 19 paper, and both have earned high marks for their output quality. Reason 1: Quality. The R2400 uses the Epson's new UltrachromeK3 ink system, which provides a wider color gamut (the ability to print a broader range of colors) than other Epson ink technologies. And thanks to three different black ink cartridges (black, light black, and light-light black), the R2400 also provides a significant increase in the density of blacks. The R2400's driver also has an "Expert B&W" mode that lets you print exquisite black-and-white prints directly from color images. Many serious B&W photographers prefer to do color-to-B&W conversions themselves�you can get more control over tonality by tweaking settings in Photoshop (or in iPhoto, as described on page 133 of my book). But the R2400 gives you another workflow option, and it's an appealing one�and it's one that the R1800 doesn't provide. Photographer Jeff Schewe, a renowned Photoshop guru and the editor-in-chief of PhotoshopNews, put it this way: "the new Ultrachome K3 inks have made tremendous advancements in the state of digital fine art printing and moved B&W digital printing out of the dog house and into the mainstream." Reason 2: Media Handling. The R2400 can print on stiff card stock as thick as 1.3mm, thanks to a straight-through paper path. (You can manually feed stiff media through the openings in the front or the rear of the printer.) 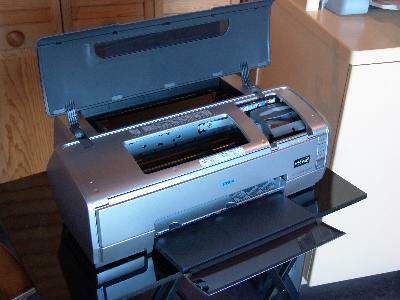 The R2400 can also print on canvas and other fine-art papers that the R1800 doesn't accept. The R1800 does have one media-handling feature that the R2400 lacks: It can print directly on CDs or DVDs. But hand me a Sharpie and I can, too. One's a printer, the other's a darkroom. In the end, the R2400 is the better printer for serious digital printmakers. I'm an amateur when it comes to digital printmaking, but I take very seriously the wisdom of professionals like Jeff Schewe, Greg Gorman, Michael Reichmann, and Joseph Holmes. Their verdict is clear: the R2400�and, more generally, the Ultrachrome K3 ink system�is now the printing technology to beat. Tomorrow (June 21) at 6 pm, I'll be appearing at Apple's flagship San Francisco retail store. I'll be sharing some of my favorite iLife '05 tips and talking about the new edition of my book and DVD�and how the Mac was used in every aspect of their production. If you live in the Bay Area, stop by and say hello! Or save gas and just buy the book. Amazon.com is selling The Macintosh iLife '05 for $23.09�34 percent off the cover price. It's a swell deal for a 345-page, full-color book that includes a two-hour, 43-minute instructional DVD. Learn more about the top-selling iLife book, then order yours. Store it. How much disk space will that digital audio project use up? And how many CDs or DVDs will it take to back it up? Get the answers to these and other questions with Silentway's Digital Audio Disk Space Calculator. It's an Excel spreadsheet, and here's what Silentway has to say about it: "Here is a very useful freeware calculator which allows you to enter the running time of digital audio (uncompressed), and it will give you the resultant hard drive storage requirements in all of the following bit/sample rate combinations: 16bit/44.1k, 16bit/48k, 24bit/44.1k, 24bit/48k. It also calculates the number of CD-Rs or DVD-Rs it will take to back it all up. You can enter three things: the running time, how many tracks (enter 2 for stereo tracks), and how many takes. Then it spits out totals for each song and for the whole project." Tour it. I've loved Apple's QuickTime VR technology since it came out back in 1994. I have fond memories of an afternoon spent in Cupertino at Apple's Advanced Technology Group, interviewing Eric Chen, one of QTVR's creators, and Ted Casey, a talented photographer who was a member of the QTVR team. I've shot many QTVR panoramas over the years, and yesterday, I came across a spectacular panorama that I want to share with you. It's of a place called the St. Rose Tavern, in St. Rose, Louisiana. Check it out (2.4MB movie). I've stared at this panorama for far too long. The artistic and technical production values are flawless, and the tavern�oh, man, what a place. The hand-scrawled sign next to the ancient refrigerator advertises "Crawfish and potato salad." Another sign lists the financial rules: "We are sorry, no checks, no credit cards, only American cash." A set of shelves holds stacks of vinyl records. A canoe paddle leans next to a weathered door that bears a Ducks Unlimited poster. I want to eat and drink myself silly in this place. Kudos to Alfonso Bresciani of New Orleans-based Pompo Multimedia for a beautiful tour. Fortune reports that Michael Dell would be interested in licensing a future Intel-processor version of the Mac OS from Apple. You will see Intel-based Macs capable of running Windows. But you won't see beige boxes capable of running OS X.
Update: Permit me to qualify that last sentence as follows: Buy you won't see beige boxes capable of running Apple-licensed copies of Mac OS X. Kids who wish their parents had bought them Macs may develop hacks that enable OS X to run on beigeware, but it'll be flakey and prone to breaking every time Apple releases an OS update or other patch. The speech is 2200 beautiful words of wisdom, and it resonated with me on several levels. My life's dots have connected in ways I never could have imagined: from my childhood piano lessons to the time I spent in my dad's recording studio to the darkroom I set up in my basement to the used 8mm movie camera I bought in high school to my first full-time job, as a typesetter. That string of dots leads so directly to the Mac and to iLife that it's scary. But who knew? I was just doing the things I loved. The rest of Steve's speech�about love, loss, and death�resonates with me on very personal levels that I won't discuss here. Suffice it to say that I've always respected Steve Jobs' aesthetic sense and business acumen. Now I also deeply respect the man. Steve, on the subject of living each day as if it was your last, I'd like to recommend a song: Jazzanova's Wasted Time. It inspires me. Let's talk iLife, shall we? Yesterday on Macintouch, there was a discussion of iPhoto 5's sharpening feature. One reader complained that sharpening adjustments didn't seem to be saved, while another wisely pointed to this Apple support document that address the real issue: in order to accurately see the results of sharpening, you need to view your photo at a 100-percent zoom setting. Here's an excerpt from The Macintosh iLife '05 that discusses this: "iPhoto's edit view introduces some softness of its own when it scales a photo to whatever zoom setting you've made. To get the most accurate on-screen view possible, view your photo at 100 or 200 percent when making sharpness adjustments: press the 1 key to view at 100 percent, and the 2 key to view at 200 percent." There's a lot more to discuss about sharpness. For example, it's often a good idea to apply a fairly aggressive amount of sharpening before printing a photo on an inkjet printer. It's all in the book. And it's all yours�along with a two-hour, 43-minute instructional DVD�for $23.09 at Amazon.com. Order The Macintosh iLife '05 today. And do something you love. Old continues to meet new. I've written several posts discussing the availability of classic radio shows and old radio aircheck recordings. Now there's more: here's a site that delivers old radio shows as podcasts. Developer Joe Maller has published some AppleScripts that manipulate the dates of photos and movies stored in iPhoto. There's good stuff here for anyone interested in (or frustrated by) the way iPhoto handles chronology. Have fun and don't forget to listen to Point & Click radio tonight! It's another busy day, but I have a couple of tidbits to pass along. My friend and radio partner Bob Laughton just returned from vacationing across France (here's his Flickr photostream). He brought some treasures home for me, including what is the tiniest tabletop tripod I've ever seen. The Bilora Digi Pod Micro weighs 50 grams and folds into a nearly flat shape that's six inches long and looks a lot like a drafting compass. Unfolded, it's about 3.5 inches high. You could carry this puppy in a jacket pocket without anyone knowing. You could even tuck it into your pants pocket, though you might risk someone asking, "Is that a tripod in your pocket or are you just glad to see me?" The tripod is surprisingly sturdy, though it's a bit shaky when it's holding up my hefty Sony DSC-F828. With a smaller digital camera, such as my Canon S-50, it's rock solid. Bilora is a large photo accessory manufacturer based in Germany. And, my fellow Americans, therein lies the rub: I haven't found any US dealers who carry the Digi Pod Micro. Maybe you'll have better search results. Or maybe you have a European friend who can send you one. Bob tells me this little kid costs less than 4 Euros. I've had my R2400 for several days now (read my setup report), and I'm in love, love, love. The black and white output from this printer is simply stunning. Back in my photographic darkroom days, I'd struggle for hours to get a print with the kind of rich tones that the R2400 produces on the first try. And just so you kids know how good you have it these days: the very first printer I bought was a Radio Shack Line Printer II. It connected to my TRS-80 Model I. 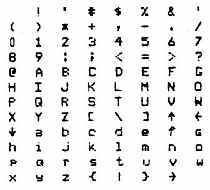 It was a dot matrix printer, and its lowercase characters couldn't even print true descenders: the lowercase g, for example, was actually a tiny capital G.
The Line Printer II costs $999�$150 more than the Epson Stylus Photo R2400. It's here! My Epson R2400 arrived from Adorama yesterday, and I've spent the last several hours setting it up, making test prints, fondling it, and doing all the usual things one does with a brand-new piece of expensive technology. The print quality is also impressive, although I'm having a problem getting my printer's ink nozzles completely clean. As a result, I'm seeing just a slight bit of banding in some of my prints. And in the course of cleaning the ink nozzles again and again, I've wasted what feels like gallons of ink. I've made only three prints so far�two 8.5 by 11 and one 13 by 19�and some of my $13US apiece cartridges are almost half empty. This girl likes to drink. But let's begin at the beginning�with the obligatory unpack and setup photo shoot. Epson's documentation instructs you to turn the printer on before loading ink. Each cartridge slot has a small indicator light above it. When the light's on, that cartridge is empty. 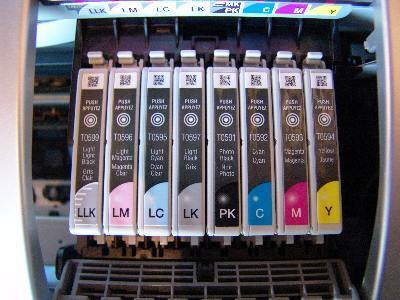 On my printer, one of the lights�the one for the magenta cartridge�was not lit, even though the printer is brand new. I'm hoping this doesn't indicate a problem. 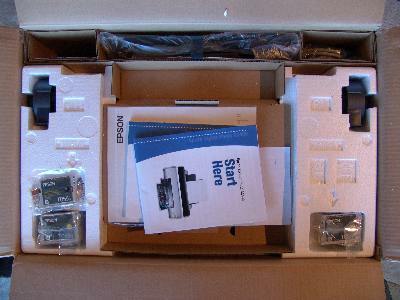 The last thing I want to test is Epson's warranty support, especially for a box that weighs 37 pounds. Loading up the ink is easy. Before unwrapping the cartridges, shake them a few times, then insert each one in its respective slot. Each cartridge is shaped slightly differently, so you can't insert it in the wrong slot. 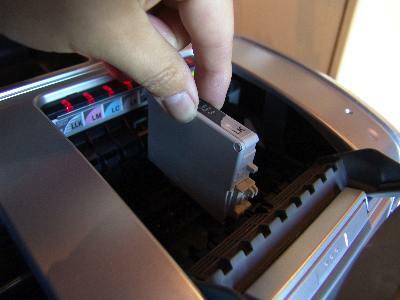 Once you've inserted all eight cartridges, you close the cartridge door and push a button on the front of the printer. The printer then chugs away for about two minutes as it charges its ink lines. Next, I connected the printer's FireWire cable to a FireWire hub and installed the drivers. The R2400 installation CD also includes additional color profiles that I'll be experimenting with later. My first test was a letter-sized print printed directly from iPhoto. The Epson driver provides numerous paper-size and paper-handling options, and I decided to start out with a borderless print. The two letter-sized borderless prints I've made have a tiny�less than one-sixteenth of an inch wide�white strip on one side. This may be operator error, though. The one 13 by 19 print borderless print I've made is indeed borderless, and is gorgeous. Really gorgeous. 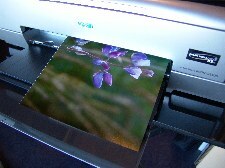 The three prints I've made this morning have been on Epson Premium Luster Photo Paper. For one of the prints, I tried the R2400's advanced black-and-white mode. In this mode, Epson's driver does an on-the-fly conversion of a color image, and several dialog box options allow you to tweak the contrast and tonality settings of the resulting print (learn more here). The results are amazing. My first test print was easily the best black-and-white print I've ever seen come out of an inkjet printer. The blacks are truly black, with no slight tint. It looks like it came out of a photographic darkroom. My impressions after four hours? Wow. Anyone want to buy a Beseler 23C enlarger? Of course I'll be posting regular updates as I get to know this lovely machine. But now, if you'll excuse me, I'm off to order some more ink cartridges. Speaking of ordering. Have you ordered your copy of the world's best-selling iLife book? Amazon is selling The Macintosh iLife '05 for $23.09. That quite a deal for 345 full-color pages and a two-hour, 43-minute instructional DVD. Read the reviews on Amazon's site, then order your copy�so I can afford to feed this new printer of mine. A source deep within Apple, someone I will call Deep Rosetta, has sent me a copy of what she claims will be the startup sound of the new generation of Intel-based Macs. Download it now (112K AAC file). I'm kidding, of course. I made that little ditty myself using Apple's Soundtrack Pro software. Ah, this is going to be fun. A couple of correspondents thought my remarks of yesterday were a bit flippant. I'm offended. I thought they were completely flippant. It's just another transition, my friends. I've seen many of them since late 1983, when I started working with this platform. I remember the hew and cry that went up when developers had to adapt their software to run under MultiFinder. There will be some transition pains. There will be technical adventures. There will be software upgrades. And there will be rewards, such as fast laptop Macs that don't feel like hotplates on your thighs. Not that that's the worst feeling in the world. Flippant? You bet. I'm a consumer advocate and a teacher, Jim, not a pundit. My respect for pundits is somewhere down around my respect for know-it-all gasbags. Steve Jobs rescued this platform from the depths of boring beige boxes that had indecipherable model names and ran a creaky, outmoded operating system. If he says we need to switch processor architectures to keep things interesting, then lead me to the lemming line. I'll be talking (and talking and talking) about Apple's move to Intel processors tonight on Point & Click Radio, the weekly radio show that I co-host here in the wilds of Mendocino County. Listen in at 7:00 pm Pacific time, if you like, and call in with any opinions you might have on the matter. Our toll-free number (listed on the Web site) works throughout the US. It is better to keep your mouth shut and let people think you're stupid than to open it and remove all doubt. Those wise words came to mind many times over the last few days as I read the blathering of analysts, bloggers, editors, and others who think they have a better bead on what's going on at Apple than Apple does. Way too many people have embarrassed themselves recently by offering ill-informed opinion, incorrect predictions, and just wild guesses on what a move to an Intel processor architecture might mean for the Mac platform. It won't happen! It'll mean doom! Three major transitions in 15 years! Captain, she can't take much more of this! Well, guess what? It appears that the old starship will do just fine. Some very smart engineers�smarter, I think, than the alleged experts I've been reading�have apparently been doing a lot of work for a long time to make sure that a transition to a different processor architecture will be pretty painless for you and me. There are some unanswered technical questions, but we'll learn the answers soon enough. But the move to Intel processors isn't going to be as traumatic as the move from OS 9 to OS X or the move from 680x0 to PowerPC. The Mac is going to remain the Mac. Future Macs will also be able to run Windows, if that's your idea of a good time. Full ahead, Scotty�and while you're at it, beam all the pundits to a remote penal colony. My UPS tracking number says that the printer is in Philadelphia today, checking out the Liberty Bell and other sights. It's due here in California on Thursday, and I'm excited. Now if you'll excuse me, I'm working on a GarageBand remix of the insipid Intel Inside chime. Please, Steve, don't let that be the startup sound of the new Macs. One last thing: I've recently scheduled several appearances over the next couple of months; I've added a list to the sidebar along the right side of this page. Let's get together! What a week. What, a week? Incredible�it's Friday already. I'm still swamped, but wanted to leave you with a few odds and ends. Quick! What's the keyboard shortcut for the Undo command? Most Mac users know it, and all Mac users should: it's Command-Z. Okay, smarties, what's the keyboard shortcut for the Redo command? Answer: It depends. The software industry is annoyingly inconsistent. Witness: in Apple's apps, the keyboard shortcut for Redo is Shift-Command-Z. In Photoshop Elements and Microsoft Office, it's Command-Y. In Photoshop CS2, it's Command-Z (again). In Adobe Acrobat 7, it's Shift-Command-Z. C'mon, kids�can't we settle on something? I vote for Shift-Command-Z. Well, the new printer is shipping, according to several online retailers, but Ink Jet Arts of Salt Lake City, Utah has yet to ship the one that I ordered on May 25. The latest cryptic email I received says it may go out today. I have to say, my e-commerce experience with these guys hasn't exactly been silky smooth. Rest assured I'll shout from the Web's mountaintops when my printer arrives. This Sunday evening, I'll be a guest on San Francisco's mighty KGO, the flagship ABC Radio Network station on the West Coast. I'll be sitting alongside host Karel as the guest for his semi-regular MacDaddy feature. We'll be talking about iLife '05, Tiger, the Mac, and more. My guest slot takes place from 9:00 to 9:30 pm Pacific time. Have a good weekend, and don't forget to listen in! Book 'em. Many thanks to Apple for mentioning my book in yesterday's Apple eNews newsletter! Don't forget, Amazon has restored the 34 percent discount on the world's best-selling iLife book. $23.09 gets you 345 full-color pages and a companion instructional DVD that runs for two hours and 43 minutes and dovetails tightly with the book. $23.09! Get yours now. Busy day today; two quick items. Item One. The UK-based Music Thing blog has a cool post on music in space: the various efforts undertaken over the years to take and play musical instruments in outer space. Memo to NASA: check out GarageBand! Don't miss HobbySpace's page on related topics. I could spend the day here if I wasn't staring at a deadline. Item Two. Tonight, I'll be hosting Point & Click Radio on our local public radio station. My guests will be Laurie York and Carmen Goodyear, two visual artists turned documentary filmmakers. Their first documentary, Freedom to Marry, was edited and produced on their iMac�and will be shown on PBS television stations across the country this summer. We'll talk about the technical challenges they faced as well as the promise and potential of Mac-based filmmaking, and toward the end of the show, we'll take calls from listeners. The show will stream live at 7:00 pm Pacific time; you'll need the often-obnoxious RealPlayer to listen live. Can't bear RealPlayer? I'll post an AAC archive within the next week.